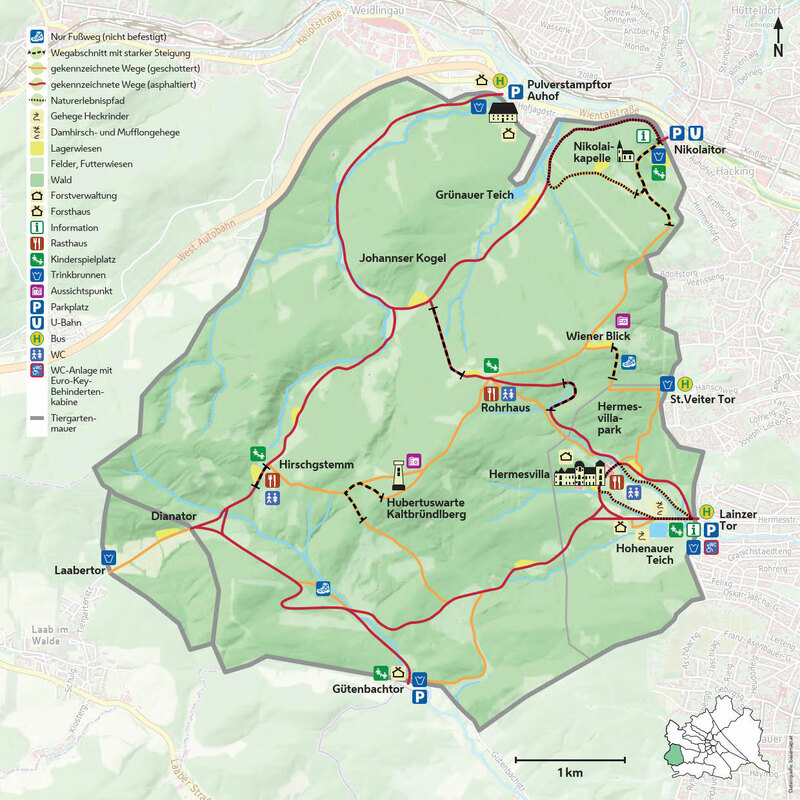 The Lainzer Tiergarten is a 24.50 km² (6,054-acre) wildlife preserve in the southwest corner of Vienna, Austria, 80% of it being covered in woodland. It dates back to 1561, when Ferdinand I of Austria created it as a fenced-in hunting ground for his family to use. Since 1919, it has been open to the public. Its name consists of its location by the Lainz district of Vienna's 13th District, and Tiergarten, which means zoo (literally, "animal garden"). As it is open year-round, and is home to a visitor center, the Lainzer Tor is the preserve's main gate. It is also the origin and the terminus of a 2.2 km (1.4 mi) walk to the Hermesvilla, which can often also be ridden via horse carriage. Public restrooms are also located near the gate, as is a water fountain. This is also one of two gates that has a parking lot. The Lainzer Tor is located at the end of Hermesstraße, and is reachable using the 60B bus, which connects the gate to the 60 and 62 trams line at 15 to 30 minute intervals. These tram lines can be taken from the stop Hermesstraße, and connect to multiple U-Bahn and S-Bahn lines. Line 62 can also be taken directly from the Vienna Staatsoper to Hermesstraße. Four woodpeckers can be found here;-Great spotted,Middle spotted,Green and Grey-headed aswell as Red-breasted flycatcher,Short-toed Treecreeper, Golden oriole and Serin.